Housewarming gifts are typically cookie-cutter affairs—i.e., a nice bottle of wine. But if you want to kick your gift-giving up a notch, there are plenty of more personal options. So whether you want to be the most thoughtful gift-giver in town, or just celebrate your own home purchase with a memorable new piece of home decor, here are some custom ways to toast home sweet home. 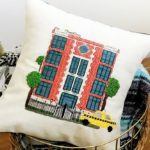 These custom cross-stitched pillows ($185+, Etsy) are not only a one-of-a-kind housewarming gift, but also an extra-special piece of home decor. Just send in a photo of the home and they’ll stitch accordingly. Placed on your living room couch, it’s bound to get showered with compliments from guests. 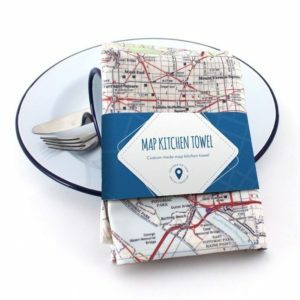 This map kitchen towel ($30, Butler & Hill) can be personalized for any home address. Simply send in the streets and numbers, and the 100% cotton map towel is custom-designed to be centered on the home. 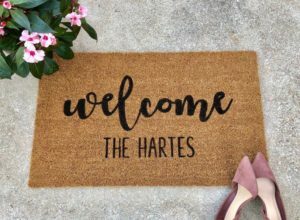 Nothing says home sweet home like a personalized doormat ($35, Etsy). It’s the first thing guests will see when they arrive, and it’s such a sweet way to put an individual touch right outside the front door. This custom return-address stamp carrying a portrait of the house ($78, The Small Object) is beyond cute. 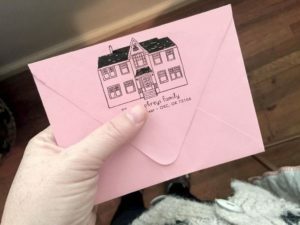 Just send in a photograph of the house you want to honor, and the artist draws a tiny illustration, adds the address, and turns it into a rubber stamp that can be used for all outgoing mail—and maybe even for making housewarming party invites or change-of-address cards. What better way to celebrate a new or beloved home than with a house portrait? 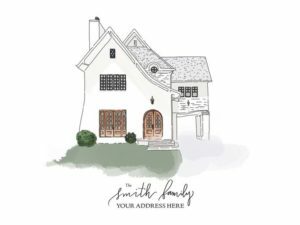 These custom watercolor home portraits ($45, Etsy) can be gifted in digital format to the homeowner or used to create an art print that celebrates the home. Home is where the heart is, but it’s also the exact spot where you put down roots and plug in your TV. 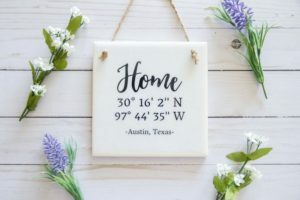 This personalized ceramic tile sign ($40, Etsy) can be customized with a home’s exact geographic coordinates. Hang or display the pretty tile as home decor or use it in the kitchen as a trivet. 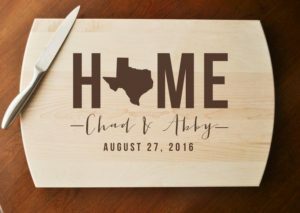 This cutting board ($28, Etsy) can be customized to include an image of the home state, family names, and a move-in date or year. Use this board at the housewarming party to serve a cheese or charcuterie spread—and for years to come after that. 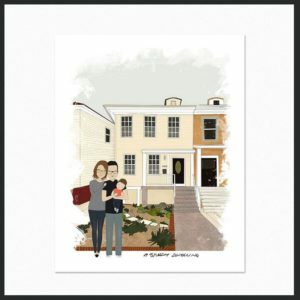 This custom family-and-house portrait (starting at $128, Etsy) makes a fabulous gift, and a one-of-a-kind reminder of all that is home. Send photos, and the artist creates a digital file that you can then print and frame or share online. You can even add the family’s name, a home address, or a meaningful quote or text.